Awaiting for the DDA draw results date for housing scheme 2014? DDA will draw results by 10th of November but what is the dda draw procedure or how DDA will allot flats to applicants? for solution of such query I have published this post so that you can understand what is the procedure of DDA to draw flats results for housing scheme 2014. 1st Stage Randomization of Applicants & Flats:- The application records and the flats are randomized by affix random numbers to each application and each flat and sorting them on random numbers after that randomized applicant record and randomized flats will be printed on papers. Printed form of randomized applicant record is called Cross-Reference of Applicants and similarly the printed form of randomized flats is called Cross-Reference of Flats. Both the cross references of applicants and flats will be placed before the judges for checking to see that all the applicants and flats are properly randomized / reshuffled after their satisfaction judges put their initials on these records. 2nd Stage Picking of Lucky Numbers:– Boxes having numbered coins 0 to 9 in each box are used for this purpose, one box for each digit are placed before the judges for deciding the starting positions for the Applicants and the Flats in the above said cross references where from the allotment process is to be initiated by the computer. Position starting for applicants will be called Lucky Number for Applicants and the same for the flats the starting position for flats is called the Lucky Number of Flats. The number of boxes to be kept depends upon the number of Digits in total number of applicants and the total number of flats to be allotted. For example if the total number of applicants is a 6 digit number and total number of flats to be allotted is a 4 digit number then 6 boxes are required for picking the lucky number for applicants and 4 boxes for picking the lucky Number for Flats. To decide the Lucky number for applicants and the flats one coin from each box is picked up by the judges after shaking each box and the number so formed by the picked up coins from the boxes for applicants and the flats are taken as lucky numbers to start the mapping process of applicants and the flats in the draw. 3rd Mapping of Applicants and Flats / Allotment Process:- Finally lucky number for applicants and flats picked up by above process are written on paper and signatures of judges are taken on it. After this, the lucky numbers of applicants and the flats are fed into the computer and the computer makes allotment by mapping the applicants and the flats starting from the positions corresponding to the Lucky Numbers in the cross references taking care of CHOICES OF LOCALITIES of applicants and the reservation of various reserved categories. While making the allotments, DDA will first up to physically handicapped people as they specified the reservation it is supposed to be given the ground floors to handicapped people. The reservation to each category is provided locality wise. The reservation for Physically Handicapped (PH), Scheculed Castes (SC), Scheduled Tribes (ST), Ex-Service Men (EX) ,War Widow(WW) etc. is kept as per their scheduled quota. In case of SC/ST applicants, the reservation is swappable. Suppose if the number of ST applicants is less than the number of flats reserved for ST, the balance flats shall be transferred to SC quota. If there also sufficient number of applicants are not there balance quota is transferred to general category. Same will be done with the SC applicants. 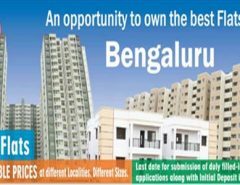 So far as other categories are concerned ,in the event of there not being sufficient number of applicants for any one ( other than SC or ST) of the categories and the number of flats of any category are more than the applicants of that category , then the excess flats are given to general category after meeting the reservation. Please tell me what is the procedure of DDA lucky draw. I have already mentioned all 3 steps in my article procedure of dda lucky draw result. If you want to ask something else can drop your feedback again. Hi, the process is quite complicated and I am unable to understand, is there a way to make it simpler to understand? I am agree with you Dapinder that process is quite complicated TBH while I read i also could not understand the whole process but while read it again understand and share it on my website in possible easy way. For more simple process of draw result I can recommend that wait for a week only and may be DDA will announce the result after that I will update my website with the list and will let you know or if there any other process to check the status I will also share and inform to you. Today is 22nd Nov’2014 but what is the date of final lucky draw result ? There is not any update from DDA regarding the date so far. for further get in touch with DDA.